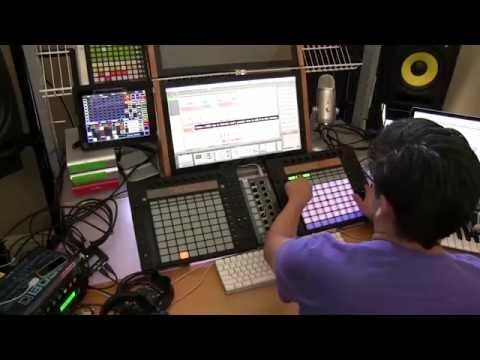 We got together with DJ Shine in his Toronto studio to talk about how he uses Liquid Rhythm on stage and in his productions! From the early 90’s heyday of Toronto’s techno scene through to his current constant touring as a band member and Ableton programmer for Nelly Furtado, Frank Ocean and more recently Broken Bells, Jason “DJ Shine” Spanu has delivered a brilliant history as a key player in the Canadian electronic music scene. As an Ableton Certified Trainer he offers wisdom and advice as a consultant to many other bands across the musical spectrum. With numerous singles, remixes, and compilation appearances under his belt, DJ Shine has made his reputation well known among some of the world’s top producers and artists. His performances as a live PA/DJ combination have rocked dance floors at huge events all over the world. When his schedule permits, Jason teaches his various production and performance techniques at clinics, seminars and on a one-on-one basis.